I’m excited about joining Hallie’s Five Favorites link-up at Moxie Wife tonight! Sometimes there are things I’d love to share, but don’t know quite where they’d fit in, so this allows me to be a little random and have some fun! 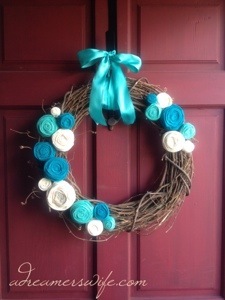 My latest DIY rosette wreath! I found this tutorial online at The Ribbon Retreat and customized it! 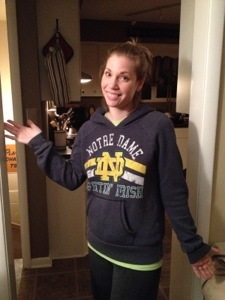 I’m thinking about actually hanging this one on the backdoor in my kitchen and making another one with black and white flowers for the red front door..
My comfy Notre Dame sweatshirt! This was a Christmas gift from my husband and it is like wearing a soft, cozy blanket! It’s my new go-to item to wear on Saturdays (and maybe Sunday afternoons, too)! 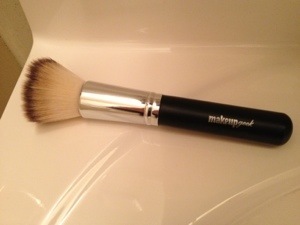 My Makeup Geek Deluxe Foundation Stippling Brush! I am so glad that I started using this MUG brush to apply my liquid foundation! It works very well and I can actually get away with using less product! Marlena, founder of Makeup Geek, posts great makeup tutorials and helpful tips, too! If you’re interested in learning more about the stippling technique, click on the link above to view the brush and you’ll see her tutorials! 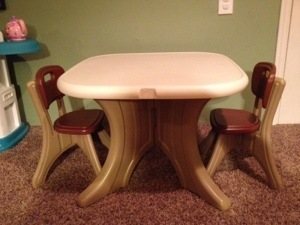 We got this Step2 New Traditions table and chairs set for the girls for Christmas! I love how big the table top is and it is very easy to clean! The girls use it all the time! My naps with my 3-year-old daughter! I live for my weekend naps with “C”. It’s so nice to get a few hours of extra sleep on the weekends. I’m going to miss when she gets older and I can’t cuddle up with her (and three of her favorite stuffed animals) anymore! Oo so impressed with the wreath and I’ll definitely have to check that makeup brush out! Thanks and you will LO-OVE the brush! What a beautiful wreath! I love those shades of blue. Thanks! I can’t wait to check out everybody’s posts on my lunch break today! Thanks for hosting! I absolutely love that wreath! And that is such a cute kiddie table. Thanks. The wreath was so easy to make! I just had to use a ton of hot glue sticks! And oooooh, naps with the babes! Totally miss that. I’m trying to soak up this cuddly time before it’s gone! Can’t beat a good sweatshirt! Oh! I am so excited to find out more about that makeup brush! Awesome! Me too! I tired to comment on your post today, but I kept getting error messages! I’ll try again later! Thanks and it was way easier to make than I thought it would be! Such a cute little kiddie table! What a find. And I love that it is washable…we have a wooden one and it has never been the same since someone colored all over it. What an adorable wreath!! when I get some time, I hope to make one too. It takes a little time to make the rosettes, but way easier than I though it would be! Beautiful wreath! I’m not a fan of wreaths for my own door (as a child my grandmother told me that wreaths used to adorn doors only when someone had died and I just can’t get over it), but I’m always looking for unique non-wreath ways to adorn our home (well, we don’t have a home of our own right now…but I pin for the future). I’m going to pin that anyway and figure out another way to showcase gorgeous flowers like that! Now you’re depressing me! The cool thing, though, is that the rosettes can be used to decorate so many things!